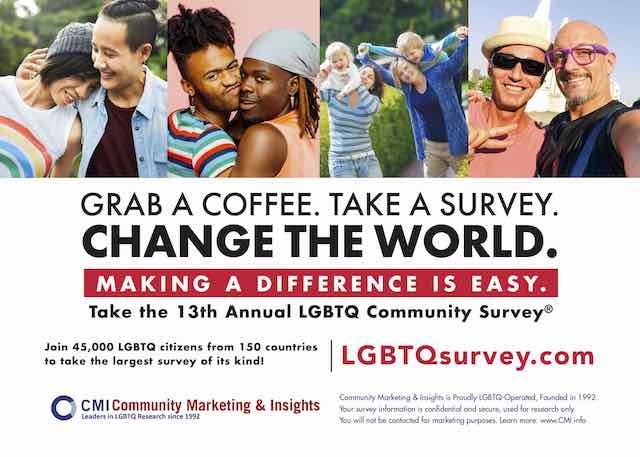 Please take part in the 13th Annual LGBTQ Community Survey. Participation in this survey gives important feedback to our LGBTQ community media and organizations, and provides valid data to companies interested in serving our community, sponsoring our charities, and supporting their LGBTQ employees. Last year’s survey yielded 45,000 respondents from 150 countries! It should take 12-15 minutes to complete. Everyone who completes the survey by May 15th, 2019 may enter into an optional drawing to win one of twenty US $50 cash prizes, or if you win, you can designate a charity to receive the $50. Additionally, we are donating $1,000 to the Trevor Project to support their work with LGBTQ youth.